I realize that this is a rather uncommon problem and that a tutorial on how I resolved it is unlikely to benefit many of my regular readers, but since I had such a hard time figuring it out and couldn’t find any guidance online I figured that maybe somebody out there might find it helpful. 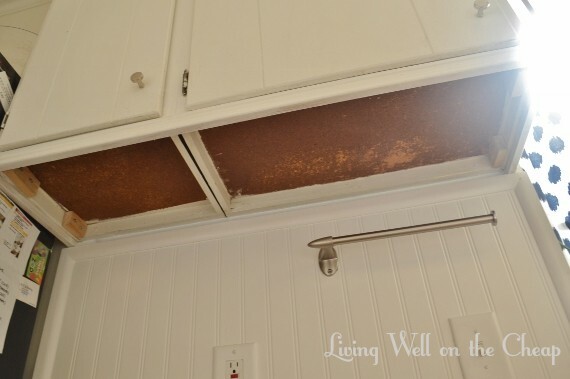 In the photo below you can see that the undersides of the two upper cabinets in my kitchen were left unfinished. This probably wouldn’t be a big deal except for A) the cork-like surface that was exposed was kind of gross and B) I have an under-cabinet stemware rack that can only be installed on a more sturdy surface. When we first moved into this house I rigged it up with a piece of scrap wood but it never looked right and so I took it down when I started working on the kitchen a few months ago. It’s taken me that long to figure out what to do here. My first thought was to install some 3/4″ plywood using pocket holes to attach it to the frame. 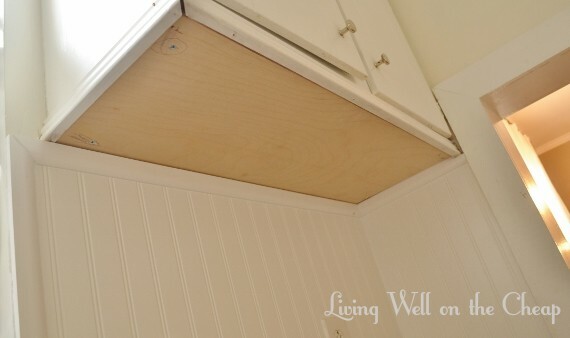 When I bought plywood for the DIY pantry doors I had Nick cut a couple of pieces to fit under the cabinets, but it turned out that it was actually too thick. I wasn’t devastated because I don’t know how to drill pocket holes anyway. Once I decided to use thinner plywood, I needed to figure out how to attach it. I was thrilled when I came up with the idea to screw a small block cut from scrap wood into each corner and use it to attach the plywood. I secured each block to the frame of the cabinet with two screws. 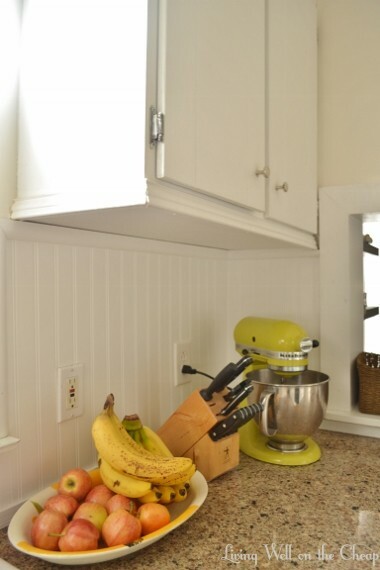 The bright light from the window makes it difficult to see, but the trim around the edge of the cabinet comes down a little further than the frame so the blocks are kind of hidden up there. 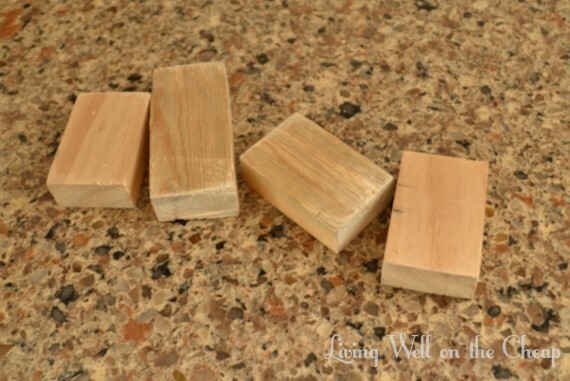 This created a perfect setup to attach some 1/2″ thick plywood with a screw into each block! On this particular cabinet I added an additional screw in the center since there was a piece of the frame available. The other cabinet has no center support but it’s not as wide so I’m confident that the four corners will suffice. I think that the 4′x2′ piece of plywood was about $17 at Lowe’s. Now that they’re painted white they blend right in, which is exactly what I was going for. The stemware rack used to hang on the right side, but I’m planning to mount it between the refrigerator and the paper towels this time. We’ve rearranged some things as part of the recent changes and all of our drinking glasses are now in that cabinet. Makes sense to keep like with like, right? Plus I like having the knives and mixer over on the other side where they’re adjacent to the main food prep area. 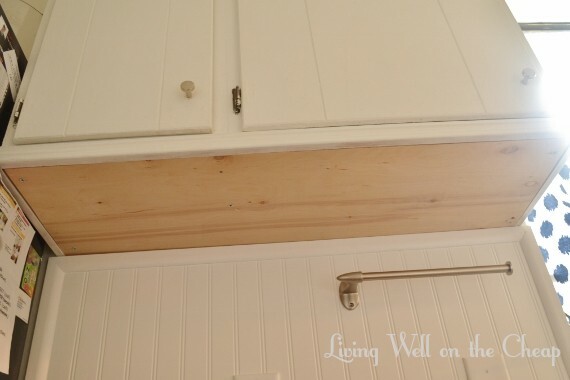 Once I finish up another project I’m working on in the pantry I’ll have room for the microwave in there and the wine glasses can go back to hanging neatly instead of sitting out on the counter. It’s so funny that I spent so long trying to figure out this solution and making it way more complicated than it needed to be, but when I finally came up with a good idea it took me only a couple of hours to knock it out by myself. It’s one of those little things that nobody would ever notice but the cabinets look much nicer and higher-end now (though in reality they are very, very old). 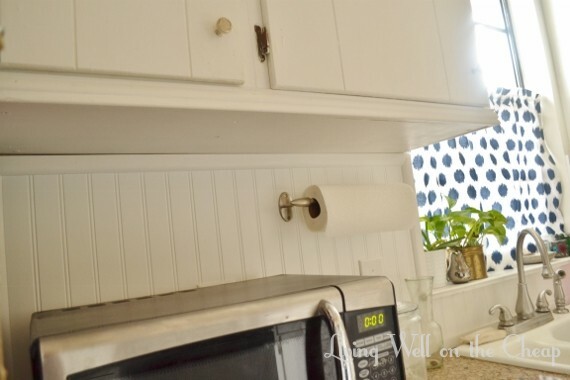 I’ve actually been thinking about doing something like this for a long time, but never bit the bullet on it because I figured it was a “short people problem,” like who is looking under those cabinets but me? haha. But our unfinished cabinet bottoms drive me nuts! This might be an upcoming weekend project for me… thanks for the cheap solution! I am also a short person, so maybe that’s why it bugged me so much! We have the same thing, but there is fluorescent lighting underneath our cabinets. At some point we’re probably going to change it out for LED lighting (and LED track lighting on the ceiling). But even then, i’m not sure how to work around the lighting. Maybe I’ll just attach a very thin piece of plywood and paint that before we install the new lighting. 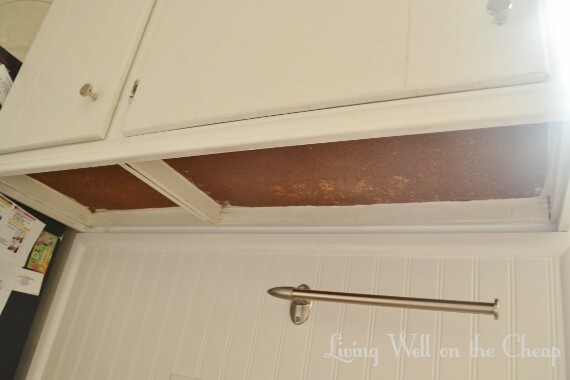 I had a question for you about your kitchen: how old are the cabinets? Our place is a condo from 1970 that for 30 years was an apartment. So there’s something like a 1/4″ of paint on each cabinet door. My assumption is that I’ll have to sand everything down to paint at all. 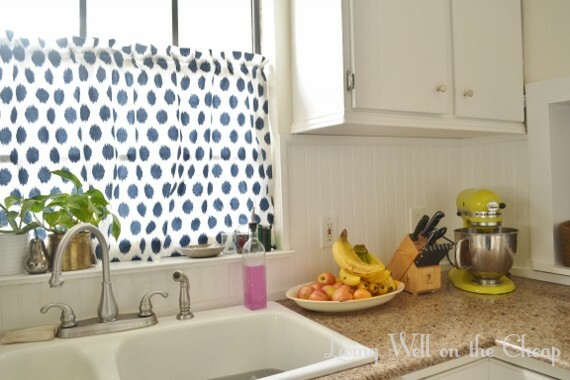 I literally peeled off an entire layer of paint on the inside of the lower cabinets when we moved in, because I wanted to put the shelf liner down on a non-peeling, flat surface. I just wonder if you’ve been dealing with similar issues. Your cabinets sure look MUCH nicer than mine! My house was built around 1920 but I’m not sure whether the cabinets are original or not. I think that they at least predate the 80′s but I don’t really know enough to judge their age more specifically. I’m lucky that they were already painted white when we moved in and are in pretty good shape. There are some newer cabinets mixed in on the bottom but you don’t really notice until you look closely. Ps I might steal you LED lighting idea! 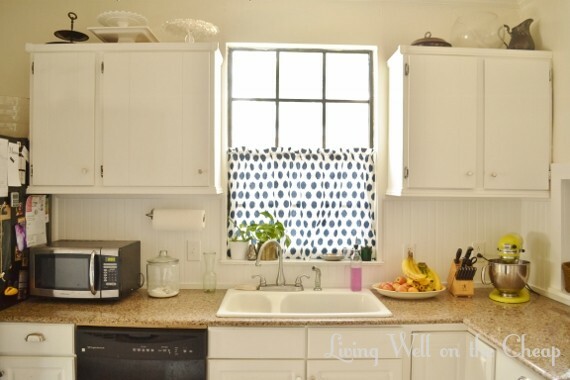 Another easy and simple project that makes a huge impact! Great Job! I notice this on our bar cabinets when I’m playing with the kids on the floor. You just gave me the push I need to do something about them. Thanks! Thanks, Katie! I’m so glad you found it helpful! Not uncommon at all! Our undersides bug me too. I figured I would just paint them all at some point, but I like the idea of finishing them off the way you did so they are flush and not indented. I can’t believe how many people have the same issue! I thought it was just a quirk of our old house.